Foreign investment is allowed almost all sectors of economy in India except some sector like defence, retail etc(which are allowed subject to Government approvals). Since, the opening of Indian economy for foreign investment in the year 1991, many changes has happened for attracting foreign investment in India. All governments after the liberalization measures started implemented or charges the policy making Indian economy more attractive for foreign Investment. The regulatory authority in FDI is Reserve Bank of India(RBI) under Foreign Exchange Management Act 1999. Under this act RBI have the power to make regulations. By exercising this power RBI has made regulation for regulating FDI and the latest one is Foreign Exchange Management (Transfer or Issue of Security by a Person Resident Outside India) Regulations, 2017(FDI Regulation). A person resident outside India may subscribe, purchase or sell capital instruments of an Indian company in the manner and subject to the terms and conditions specified in Schedule 1 of FDI Regulation. However a person who is a citizen of Bangladesh or Pakistan or is an entity incorporated in Bangladesh or Pakistan cannot purchase capital instruments without the prior Government approval. A person who is a citizen of Pakistan or an entity incorporated in Pakistan can invest, only under the Government route, in sectors/ activities other than defence, space, atomic energy and sectors/ activities prohibited for foreign investment. A Foreign Portfolio Investor (FPI) may purchase or sell capital instruments of a listed Indian company on a recognised stock exchange in India in the manner and subject to the terms and conditions specified in Schedule 2 of FDI Regulation. A Non- Resident Indian or an Overseas Citizen of India may on repatriation basis purchase or sell capital instruments of a listed Indian company on a recognised stock exchange in India, in the manner and subject to the terms and conditions specified in Schedule 3 of FDI Regulation. A Non- Resident Indian or an Overseas Citizen of India may, on non-repatriation basis, purchase or sell capital instruments of an Indian company or purchase or sell units or contribute to the capital of a LLP or a firm or proprietary concern, in the manner and subject to the terms and conditions specified in Schedule 4 of FDI Regulation. A person resident outside India, permitted for the purpose by the Reserve Bank in consultation with Central Government, may purchase or sell securities other than capital instruments in the manner and subject to the terms and conditions specified in Schedule 5 of FDI Regulation. A person resident outside India, other than a citizen of Bangladesh or Pakistan or an entity incorporated in Bangladesh or Pakistan, may invest, either by way of capital contribution or by way of acquisition/ transfer of profit shares of an LLP, in the manner and subject to the terms and conditions as specified in Schedule 6 of FDI Regulation. A Foreign Venture Capital Investor may make investment in the manner and subject to the terms and conditions specified in Schedule 7 of FDI Regulation. 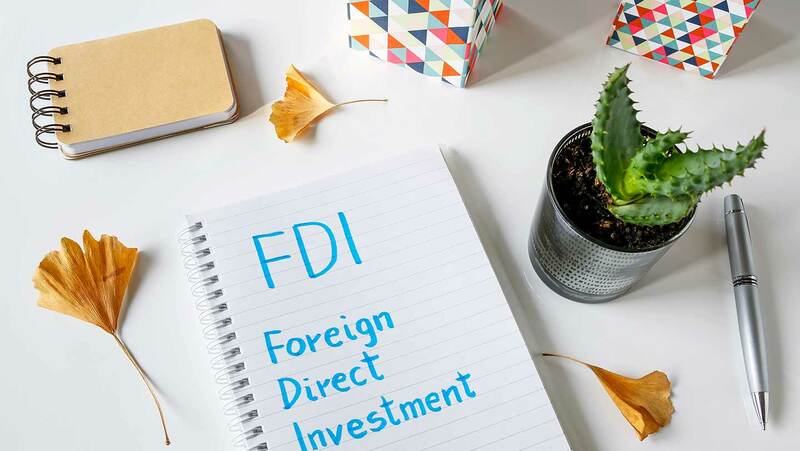 A person resident outside India, other than a citizen of Bangladesh or Pakistan or an entity incorporated in Bangladesh or Pakistan, may invest in units of an Investment Vehicle, in the manner and subject to the terms and conditions specified in Schedule 8 of FDI Regulation. A person resident outside India may invest in the Depository Receipts (DRs) issued by foreign depositories against eligible securities in the manner and subject to the terms and conditions as specified in Schedule 9 of FDI Regulation. A Foreign Portfolio Investor or Non- Resident Indian or an Overseas Citizen of India may purchase, hold or sell Indian Depository Receipts (IDRs) of companies resident outside India and issued in the Indian capital market, in the manner and subject to the terms and conditions specified in Schedule 10. Advance Remittance Form (ARF): An Indian company which has received amount of consideration for issue of capital instruments and where such issue is reckoned as Foreign Direct Investment for the purpose of these regulations, shall report such receipt (including each upfront/ call payment) in ARF to the Regional Office concerned of the Reserve Bank, not later than 30 days from the date of receipt. Foreign Currency-Gross Provisional Return (FC-GPR): An Indian company issuing capital instruments to a person resident outside India and where such issue is reckoned as Foreign Direct Investment, for the purpose of these regulations, shall report such issue in Form FC-GPR to the Regional Office concerned of the Reserve Bank under whose jurisdiction the Registered office of the company operates, not later than thirty days from the date of issue. Annual Return on Foreign Liabilities and Assets (FLA): An Indian company which has received FDI or an LLP which has received investment by way of capital contribution in the previous year(s) including the current year, should submit form FLA to the Reserve Bank on or before the 15th day of July of each year. Non-Resident Individuals and Business Incorporated outside India are permitted to start a business in India subject to provisions of Foreign Exchange Management Act (FEMA) and Reserve Bank of India (RBI) Regulations.